Choosing an enterprise analytics tool is a critical process: whichever platform you choose, you will be stuck with it for a while. Web analytics implementation is definitely a long-term project, with high organizational and financial costs. That’s why it’s good to pause and reflect before making any commitment. At this stage you probably have already documented your organizational requirements, reviewed some of the many tools available on the market, and narrowed down your options to just two contenders. But which one should you choose? Which one will be better suited to your business needs? There’s never an easy answer to this question. In this really great post Bryan Eisenberg outlines questions that will help you evaluate and map your organizational needs. But we want to go a step further and focus specifically on the very final part of the software selection process. We mean the moment when you’ve done the trials and demos, both contenders seem suitable and you need some help making the ultimate decision. 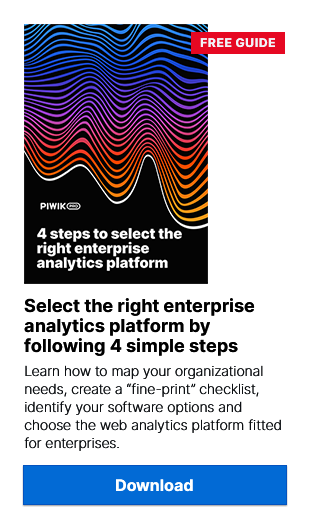 That’s why we prepared this set of 10 issues that every business owner should consider before making the final enterprise-level analytics software decision. Partly inspired by the approach outlined in this post by Bernard Segarra, we expanded it with practical and in-depth questions. If you’re stuck, you can use our checklist to compare how your test-driven tools perform and which of them better caters to your needs. Read on for discussion of each of these criteria and a list of questions to help you choose the perfect tool. You can also check our infographic and learn main fields you should consider. It is fully applicable to any organizations, even if they’re not enterprise-level entities. If you are serious about growing your business, then you need solid and reliable insights. Issues such as data sampling, referral spam and adblocks can seriously impact your data accuracy, so it’s best to rule them out as soon as possible. It is also useful to have access not just to aggregated data, but insights on individual users as well. Does the software aggregate data or is it customer-centric? Are you able to see what generates conversion of leads at an individual level? How well does the platform deal with referral spam? Does the platform sample data? If so, can you control the level of sampling easily? How does the platform deal with adblocks? Does it get stopped from doing its job or are there workarounds? Are your required reports and types of tracking available in the platform of your choice? Does your tool let you view all these insights in one place? Does your platform provide you with real-time features? Does it give you access to user-level reporting or only aggregated data? How advanced is the segmentation it enables you to perform? Enterprise web analytics usually has to function as a part of a bigger digital set-up. Therefore it’s essential to ensure that your chosen platform can integrate with the tools you already use. Another thing is steering away from vendor lock-in, that is, making sure even if for some reason you need to change your tool, you’ll still be able to migrate your data easily, without losing any of your history. How well and easily will your selected tool integrate with the rest of your existing system, for instance with your CRM? Are there authorized integrations to enable such connections, and if not, are you allowed to adjust the code to make it work for you? Can you easily migrate your data to other tools should the need arise? Are there any cases of vendor lock-in or trouble users experienced with moving data to another provider? What range of services will you get with the premium tool you purchase? Is there any training option available for companies? Is there a Service Level Agreement and guaranteed reaction times? Choosing between Software-as-a-Service (SaaS) and self-hosting may be a big, if not the biggest, decision for your organization. The majority of software is now delivered over the cloud, and this is understandable when considering cost, ease and convenience. Yet for certain types of businesses or organizations SaaS may simply not be an option – think of governments or banks. Is your organization allowed to use a cloud-hosted solution? Do you have the resources to host the tool on your infrastructure? Does your on-premises come with assisted setup and updates, or is a cloud-hosted tool a better option for your needs and capabilities? Do you know what data limits come with your plan? Doing business in certain parts of the world, such as the European Union, means that your software needs to comply with the local regulations. This especially refers to data collection and privacy protection of your users. When dealing with EU customers, you have to make sure that you comply with GDPR – problems with meeting the provisions of the new law may cost as much as €20 million in fines. Are you sure your chosen tool respects the privacy regulations in your jurisdiction? Does your tool enable you to comply with current and forthcoming legislation? If you want to learn more about ins and outs of new EU data privacy regulation, we advise you to get familiar with GDPR section on our blog. Considering the multi-year commitment you’re making, it is key to be sure that the continuity of your tool and services will be guaranteed. Of course, it is unlikely that companies such as Google Analytics will vanish from one day to the next, leaving clients without support or software updates. Yet bear in mind that certain tools get discontinued (as has happened to the self-hosted platform Urchin), so it’s useful to have an alternative plan up your sleeve. For instance, investing in open-source solutions means that your software will be able to live long after the relationship with the original vendor has ended. Do you know the vendor’s past experience and condition? Do you know what happens to the tool if the provider ceases to exist? Will you be able to develop and customize the tool on your own even if your provider is no longer available? Since implementation of an enterprise analytics solution is a long-term commitment, you should definitely check the costs of the tool, maintenance and upgrades you might incur. It’s also useful to know in advance what happens to your data should you exceed your prescribed allowance. What is a rough estimate of TCO (total cost of ownership)? How much will the tool cost you? Does traffic volume impact your pricing and what are your data limits? What happens if you exceed your allowance? Is accurate data collection continued, does the tool switch to sampling, or do you lose access to your data? What premium features can you add to your solution and how much will they cost? While individual bloggers may not worry about data ownership, this is one of key issues faced by medium to large enterprises that rely on information processing of some form. It relates to exercising legal rights and control over a given set of data, including the ability to create, edit, modify, share, and restrict access. Performance metrics are crucial, but ownership of the data that informs intelligence is just as critical, as the absence of it could hurt your business. Do you retain full control over your analytics data? Can you retrieve any data collected and stored by the tool? Does your vendor’s TOS include a clause on 100% data ownership or do they reserve the right to share information collected in your use of their services with their subsidiaries? Enterprise analytics solutions must think about convenience of end-users. It’s important to ensure the platform will be properly used and taken advantage of. The easier it is for users to adjust the dashboard and reports to their particular needs, the higher the chances that the tool will be appreciated in your organization. Can you easily customize your dashboard and reports to view your KPIs in the right perspective? Are the reports easy to read and interpret? And if not, does the tool let you call APIs to access your data and present it in a more convenient way? Searching for a web analytics tool for your business is no easy task. The broad range of tracking software options available on the market is both a blessing and a curse. Use our checklist once you’ve narrowed the search down to the final pair of contenders to make your decision easier. Keeping this set of criteria in mind will help you not only choose the right tool for your needs, but also prevent potential problems in the future. Good luck hunting! Google Analytics Terms of Service, updated on 24th of May 2016. 7 Ways Businesses Can Benefit From Open-Source Software, Clearcode Blog, January 2015, by Michael Sweeney. How do you build a Single Customer View platform?